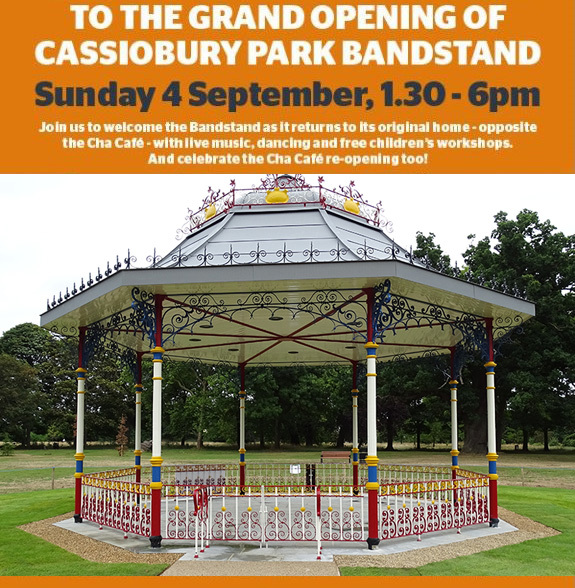 When Watford Council won funding to revamp Cassiobury Park, returning the bandstand to its original position was part of the plan. That money also paid for the renovation of the Cha Café – which opens to the public on Saturday 20 August. The development of the pools area and the creation of a hub building are still underway – that work is expected to be complete by next spring. Celebrations start at 1.30pm and will carry on until 6pm. It all kicks off – or rather, pushes off – at 8.30 in the morning, when Doctor Bike arrives close to the Shepherds Road entrance, ready to attend to your bicycling needs. Then at 10 o’clock you can take your pick from three Sky Rides - the family-friendly Cassiobury Park Special, the Weaving Whippy Wheeler (for steady riders) or the more challenging Watford Countryside Ramble – all organised in association with Watford’s Cycle Hub and The Big Bike Revival. Then it’s back to the area around the bandstand for lunch – time for a bite to eat from the barbecue – or bring your own picnic - before the Jazz, Jive and Swing festival gets underway at one. The bandstand itself won’t be open (that’s planned for later this summer), but a stage and dancefloor will be nearby. You can enjoy the music, watch the professionals dance, and then try out your own steps – all for free. The activities are funded by the Heritage Lottery Fund and Watford Council. If the sports fans among you aren’t that into dancing, don’t despair – keep the children busy with a British Cycling race for 5-16 year-olds – just £2 to enter – from one o’clock. And a big screen will be nearby, keeping pace with the final stage of the Tour de France. After the music from the Jazz, Jive, Swing event stops, the evening will end with a live broadcast of the race down the Champs Elysées.